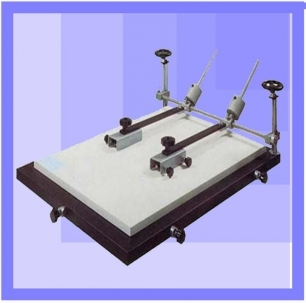 It 'a special, simple and inexpensive equipment for printing sheets and flat objects up to a maximum thickness of mm. 150. The setup is done by moving the plane from the press in all directions by means of micrometer screws that hold it, moved in all directions, and then locked away. Complete with little presses for adjusting the picture and with a counterweight that can be easily adjusted for the balance of the frame press. With metal base and top ant.